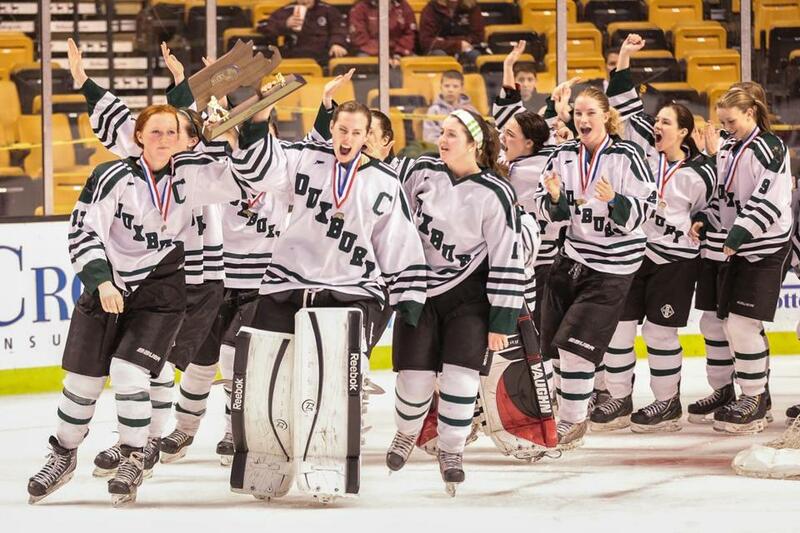 Duxbury goalie Rachel Myette leads the Green Dragons in celebrating the Division 2 title. Meet the standout performers who earned All-Scholastic honors for their work this season. Butler notched 37 goals and added 25 assists as the Spartans won their first state championship since 2010. The three-time Catholic Central League All-Star and MVP finished her career with 199 points. She has committed to play hockey at St. Anselm. Messuri led the state in scoring for defensemen, tallying 13 goals and 17 assists for the Colonials who reached the Division 1 quarterfinals. The junior also earned DCL/MVC Large MVP and All-Conference team honors. The sophomore is best known for her clutch winning goals that earned Arlington Catholic last year’s state title and qualified her squad as a Division 1 state finalist this season. Rossini notched 22 goals and 15 assists this season. The two-time Middlesex League MVP scored 34 goals and 29 assists to lead Woburn to the Division 1 state finals, losing in a shootout to St. Mary’s. Smith finished her career with 234 points, including 120 goals and 114 assists. She will play hockey at Salve Regina. Murphy led Duxbury to a three-peat as Division 2 state champs, posting 29 goals and 24 assists - a program record for most points. The SEMGHL All-Star became the 23d female in the state to join the 200-point club. She will play lacrosse for UMass-Amherst. The three-time SEMGHL All-Star captained her squad to its third consecutive Division 2 state championship. The junior led the state in goaltending for the third straight year, with a career-best 11 shutouts, 0.75 GAA and .959 save percentage. Myette also plays lacrosse. Bomba was the first female athlete on a male team to be selected First-Team All-League in the history of the Cape Ann League. The three-year starter posted 55 consecutive starts, had a career GAA of 2.89, and recorded four career shutouts. After starting her hockey career at Lynn English, Burt was the ISL co-MVP this year as the backstop for BB&N. She turned in a 1.60 goals against average with a .944 save percentage which earned her all-ISL and All-New England honors. The two-time Bay State Conference All-Star totaled 39 goals and 18 assists this season and had 152 career points (104 goals, 48 assists). Connolly holds the school record for goals in a season with 40 (2011-12). She will play both ice hockey and field hockey at Amherst College. Conway led the state in scoring with 52 goals, five shy of the record. The sophomore forward recorded a school-record seven goals in a single game (a 9-4 win over Waltham) and led her team to the Division 2 state semifinals. The NEPSAC Division 2 MVP this season, Crawford was the backstop of Proctor’s defense this year. She was the top ranked goalie with the national development team last summer with a 1.0 GAA in 12 games. An honor student, she also plays soccer and lacrosse. Davis was unbeaten in net in the regular season and finished with seven shutouts and a 1.12 GAA. The junior goalie, who has led the Tanners to three league titles, was named a Middlesex League All-Star and has a career 1.78 GAA. The five-time Catholic Central League All-Star amassed 17 goals and 28 assists to propel the Spartans to their fifth state championship. The Austin Prep transfer was second in scoring for St. Mary’s. The senior hopes to play softball at UMass-Lowell. Freda, who scored 31 goals and 16 assists, is also a Patriot League All-Star in track and soccer. She scored the tying and winning goals to end St. Mary’s 100-game unbeaten streak en route to Hingham’s 2011 state title. She will play hockey at Middlebury. The school’s all-time scoring leader unloaded 38 goals and 31 assists this season and earned a spot in the 200-point club. The junior also earned GEMIHL MVP honors and finished with a career 156 goals and 108 assists. Lizotte collected 18 goals and 31 assists this season, earning the league MVP title. The three-time league All-Star ends her career with 175 points. She has committed to Bryant to play field hockey. The senior captained her squad to the Division 1 state quarterfinals, ending her season with a 1.16 GAA, a .965 save percentage and 10 shutouts. The two-time CCL MVP has committed to Franklin Pierce. Rachlin will leave Nobles with a long list of achievements including ISL and New England championships this winter. She earned All New England honors and has won six ISL titles during her stay in Dedham. The defenseman will play at Harvard. The sophomore goalie recorded a 1.22 GAA, .951 save percentage, and eight shutouts in 19 games this season. The SEMGHL All-Star, who ranks fifth among starting goaltenders in the state, has appeared in back-to-back Division 2 state finals. The Division 1 Player of the Year in girls’ prep school hockey, Staenz led the Wallingford (Conn.) school to the tournament final before losing to Nobles. The senior forward comes to Choate from her home in Zurich, Switzerland. The MVP of the EIL, Tessier was a brick wall in net, making 417 saves this season, which was good for a 1.36 GAA and a .965 save percentage. She is also a lacrosse goalie and plays field hockey. She will attend Mt. Holyoke. In two seasons, the Boston College alum has amassed a 35-7-3 record and two consecutive Division 2 state title appearances. Coach Hunt also teaches social studies, coaches middle school softball, and volunteers with the city’s youth hockey. Bay State — Braintree: Rachael Brazil, Lauren Connolly. Dedham: Samantha Girard. Framingham: Cassie McKinnon. Milton: Courtney Driscoll, Erin Higgins, Sarah Park. Natick: Lexi Harvey. Needham: Dana Campbell. Newton North: Hannah Gallogly. Norwood: Heather Folan, Emily Kelly. Walpole: Brooke Matherson, Michaela Tosone. Wellesley: Molly Connolly, Cecily Docktor, Sarah Goss. Weymouth: Taylor Rheault. Catholic Central — Archbishop Williams: Katie Barry, Ashley Dallaire, Erin Dwyer, Kiera Dwyer. Arlington Catholic: Megan Messuri, Jessica Piracini, Melissa Richard, Adrieana Rossini. Austin Prep: Kiely Annese, Shannon O’Neil. St. Mary’s: Alison Butler, Gabby Croynale, Tatiana Doucette, Kaleigh Finigan, Lauren Skimia. EIL — Berwick: Gabrielle Wiggin, Anna Wright, Kaitlyn Wurzer. Dana Hall: Hannah Piersiak. Newton Country Day: Caitlin Stadler. Pingree: Mackenzie Foster, Leah Heinze, Jillian Witwicki. Portsmouth Abbey: Sally Hoerr, Maddy McCann, Ally Tessier. Winsor: Carolyn Holthouse. GEMIHL — Beverly: Olivia Konaxis, Caitlin McBride, Katie Stella, Beverly Thompson, Nicole Woods. Cambridge: Nicole Giampa, Kellie Haggerty, Ruby Johnson. Everett: Alea Martinelli. Marblehead: Brittany Lydon, Rachel McKay, Brittany Smith. Masconomet: Kendra Dow, Alex Jones. Medford: Brittani Lanzilli, Samantha Lopilato, Adrienne Porrazzo, Marissa Williams. Peabody: Courtney Smith. Shawsheen: Samantha DiVito, Kennedy Harper. Winthrop: Kara Donati, Cat Salvetti. ISL — Brooks: Kate Haslett, Bella Papapetros. BB&N: Katie Burt, Bradley Fusco. Governor’s Academy: Siobhan McDonough, Maggie Salmon. Groton: Maeve McMahon. Lawrence Academy: KJ Davis, Victoria Hanson. Middlesex: Ashley Arnold. Nobles: Lexi Laing, Natasha Rachlin, Tori Shea, Robyn White. St. Mark’s: Teal Gosselin, Victoria Shea. St. Paul’s: Brooke Avery, Miriam Eickhoff, Caitrin Lonergan, Shayna Tomlinson. Merrimack Valley/Dual County — Acton-Boxborough: Megan Barrett, Leah Cardarelli, Annie Messuri, Lauren Roche. Andover: Meaghan Keefe, JoJo Olsen. Billerica: Kelly Broderick, Amanda Burns, Christy Caliendo. Chelmsford: Rachel Bossi. Concord-Carlisle: Michaela Haller. Lincoln-Sudbury: Nicole Lynch, Sarah Provost, Cammie Vercollone, Melinda Vercollone. Methuen: Amanda Conway Tewksbury: , Amanda Conway. Newton South: Karina Alfisher, Kayla Kee. Wayland: Jane Haffey Weston: , Katherine Goguen, Cara Lembo. Westford: Kimberly Lizotte, Sarah Lizotte, Lindsay MacDonald. Middlesex — Arlington: Hannah Wright. Burlington: Holly Brouillette, Kelsey Ryan, Krista Toscano. Lexington: Carolyn Avery, Jackie Denning, Sara Lehman. Reading: Ali O’Leary, Caroline Seibold. Stoneham: Lynn Kozlowski. Wakefield: Bailey Finocchio, Gabriella Moscato, Miriam Wood. Watertown: Emily Loprete. Wilmington: Shelby McHugh. Woburn: Cassandra Connolly, Courtney Davis, Kayla Smith. SEMGHL — Barnstable: Sarah Boule, Morgan Richard. Canton: Jill Eckler, Bethany Kelly, Meghan Lennon, Meaghan McKenna. Dover-Sherborn: Brittany Carter. Duxbury: Jane Dudley, Marissa Fichter, Ally Hammel, Hannah Murphy, Rachel Myette. Falmouth: Hannah Ghelfi, Rachel Moore, Madison Scavotto, Alexa Scribner, Amy Wilson. Franklin: Hannah Magerman, Alex Mitchell. Hanover: Julia Dares. King Philip: Danielle Hamilton. Latin Academy: Jordan Fleming, Natalie Lombardi, Kathleen Torpey. Marshfield: Taylor Newcomb. Martha’s Vineyard: Aubrey Ashmun, Texe Craig. Medfield: Mimi Borkan, Nicole Reardon. Medway: Katrina Anderson, Kait O’Sullivan. Quincy: Erin McGinnis. Norwell: Lily Cleary, Tori Dinger, Caroline Nichols, Rachel Talanian. Sandwich: Courtney Alexander, Katie Flynn, Maggie Layo. Scituate: Hannah Clougherty, Corey Murray. Westwood: Siobhan Burke, Ela Hazar, Kailey Jacobs. Pembroke: Jane Morrisette.